Oh, that rhymes. Ha! You should nickname me "Dead Head." 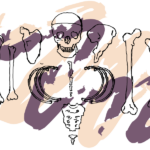 Perhaps the most iconic (and most confusing) image of all is the lightning bolt skull, thought by some to be the band’s official logo. It is relatively simple in design — a skull inside a blue-and-red circle, with the top of the skull split in half by a lightning bolt. It’s a little bit scary. It turns out that the logo is the brainchild of Mr. Augustus Owsley Stanley III, sometimes known as “The Bear.” The Bear was a soundman for The Grateful Dead in its early days. Being from a family of some means, he also helped finance the band. The Bear initially came up with the logo as a way to help keep track of all the gear. When he wasn’t dealing with matters related to gear, band logos, and rock ‘n’ roll finance, The Bear cooked up drugs. He could whip up a batch of meth with the best of ’em, but his specialty was LSD. Everybody loved The Bear’s acid, probably because he went light on the rat poison. I suppose the skull logo is jarring because it doesn’t seem harmless or light-hearted at all. We all know that drugs were big in the ’60s, particularly drugs of the “mind opening” variety. 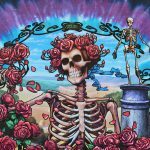 We all know that a big part of the Grateful Dead experience was psychedelics. The skull points to something serious at the heart of the dope and the dropping out. Losing your mind. That’s what the Dead were flirting with all the time, and they knew it. The lightning in the skull is the perfect imagery for a group of people fully prepared to blow their minds wide open. When I was a teenager in Los Angeles we sometimes used to hang out with an old guy who had, legendarily, once eaten an entire sheet of extremely potent acid. He would explain to anyone who cared to listen that his teeth were made of diamonds and that he had to be extremely careful about chewing. I spoke to him many times about this matter and, the thing is, he really and truly believed that his teeth were delicate diamonds. Our collective memory of the ’60s has mellowed with time and nostalgia. The Baby Boomers have moved on from LSD and Peyote to Prozac and Viagra. 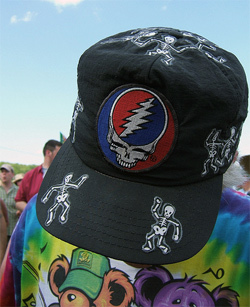 The skull logo and the rest of the necrotic imagery are thus a helpful reminder that the Grateful Dead were playing with oblivion. The Merry Pranksters (Ken Kesey’s group of psychotropic-sampling friends for whom the Dead enjoyed performing) were sometimes known to dance directly to the grave, or prison, or complete madness. Part of being a Dead Head was agreeing to part ways with reality as the rest of the world understood it. That parting of the ways was often permanent. The Bear is still alive and truckin’. He has a Web site where he sells artworks and knickknacks from the past. You can also read his essays about the causes of glatiation (“I have been predicting the changes we are currently experiencing in the worlds climate for some years, now, but I still don’t know how much further it has to go”), children’s television (“The programming on so called ‘children’s television’ is the single most societally destructive activity ever developed”), and other matters.